To celebrate the new film Bobby Fischer Against the World, HBO Documentary teamed up with the Marshall Chess Club to host a Chess Challenge in the park last week. 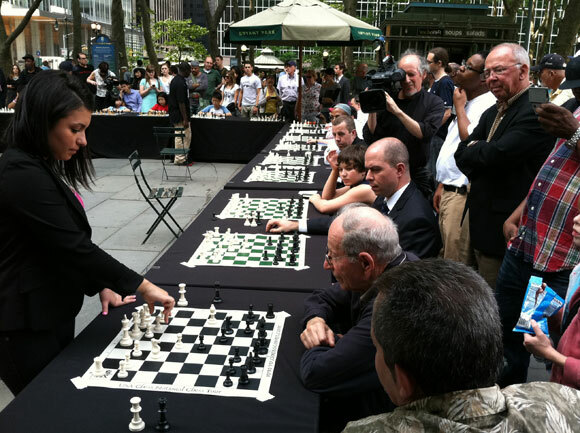 Visitors to the park were invited to test their mettle against some of the nation's best grandmasters, along with some of the youngest chess master players. I bet you've never played a game of chess this fast. Watch these pros, of all ages, in action at the park. We're hoping the Chess Challenge will become an annual event. That means you've got an entire year to brush up on your skills at the Chess Area in the park. Come alone or with a partner. Games can be arranged any weekday by an expert from the Marshall Chess Club. i am more of a checkers fan, chess has always been a little complicated. But more interesting too. I admire people who have gotten so good at it!